Starting out Paul was performing anywhere he could. From doing contests, awful bar gigs where he stood on soda crates as a stage and even someones living room holding an empty corona bottle as a mic. Paul now headlines all across America. Many of the nations top comedy clubs have called him one of the strongest up and comers working today. Paul has also opened for some of the biggest names in the business. Comics such as Bill Burr, Dave Attell and Jim Breuer to name a few. Recently he has toured with Bill Burr in some of the country's greatest theaters including, Constitution Hall, The Beacon Theater and Carnegie Hall where he killed in front of a sold out crowd on the most legendary stage in the world. 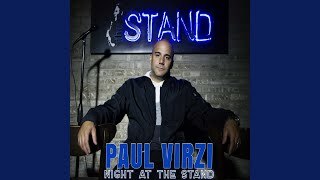 Every week you can hear him host his very popular podcast "The Virzi Effect". Some of his credits include TV appearances on AXS TV's "Gotham Comedy Live", Fox's "Redeye, and writing for the ESPN ESPY Awards. Paul has made numerous appearances at the very prestigious Just For Laughs Comedy Festival In Montreal and most recently was asked to perform at the SXSW Festival in Austin, TX. He was also a regular guest on "The Artie Lange Show" on Direct TV. Paul never fails in keeping the laughs coming and making the audience feel comfortable with his hard hitting personal approach. He is fun to watch and has a stage presence that is second to none.